PURSUANT to A.R.S. 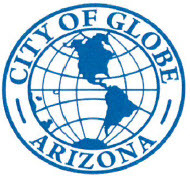 Section 38-431 .02, notice is hereby given to the Globe City Council and to the general public, that a Special Meeting of the Globe City Council will be held on Wednesday, April 17, 2019, at 6:00 p.m. in the City Council Chambers, 150 N. Pine Street, Globe, and Gila County, Arizona. A. Blue Cross Blue Shield Renewal. E. Globe Community Pool, possible funding. HANDICAPPED INDIVIDUALS WITH SPECIAL ACCESSIBILITY NEEDS MAY CONTACT THE CITY OF GLOBE AT 425-7146 OR 425-5330 (TDD) AT LEAST 72 HOURS IN ADVANCE. I, Shelly Salazar, City Clerk, do hereby certify that the foregoing notice was posted on April 15, 2019 at 4:00 pm.